Picture this: You have been in business for 12 years. You are well past the start-up stage and you are making good money. You have 15 employees (or 50 employees) and your company has succeeded and is still growing. However, on a personal level, your marriage has deteriorated to the point that you receive a letter from a lawyer informing you that your spouse has retained counsel, wishes to separate from you, and wants to divide your marital assets. In this age of high stress and high achievement, this is an all too common scenario. There are many things that can be done on a personal level to improve a marriage and to avoid your ever having to face this conflict. However, the purpose of this article is to give you some insight as to what you can expect if you, as a business owner, are in the unfortunate position of receiving that letter from your spouse’s attorney. In 1981, North Carolina joined the ranks of most other states by adopting an equitable distribution law. In essence, we require that all property acquired during the marriage (except for gifts from third parties or inheritances) be divided between the parties as marital property. Certainly, one of the items of property that you have acquired is your business. It is an asset, even though you may not view it as anything other than a “job”. In addition to it creating income for you and your family, your business is an asset that can be sold, and it is an asset that has present value even if it is not sold. Even if you owned your business before you were married, you will still have to deal with the business as an asset in a marital dissolution. The increase in value of the business since the date of marriage may well be marital property. For this reason, one of the most difficult assets to deal with in a marital dissolution is the closely-held business of one of the spouses. This is true whether the entity is in the form of a corporation or a partnership. As a business owner going through a marital dissolution, you can expect to have to give to your spouse all of your business’ financial information for the past five or ten years. This will include financial statements, bank account information, depreciation schedules, and many other financial documents that you might otherwise consider quite personal and confidential. In addition, you will have to have your business appraised for your own purposes and to meet (or in many cases, to counter) the appraised value determined by your spouse’s appraiser. Therefore, you will be giving the same sort of voluminous records and financial information to your own selected business appraiser. Depending on the size of the business, the appraisal itself can cost $10,000.00 to $25,000.00, and attorney’s fees may well be higher than the cost of the appraisal. Since two business appraisers rarely agree on the value of a business, litigation sometimes becomes a battle of the experts, with the judge deciding which valuation method or whose numbers should prevail. For all of these reasons, you can expect to undergo a very difficult process should your marriage end and a dispute arise over the value and distribution of your business. If you own your business at the time of your marriage, you may want to consider having a Premarital Agreement prepared which clearly states that your business, including all of its assets and any increase in value, will remain your separate property in the event of a separation. 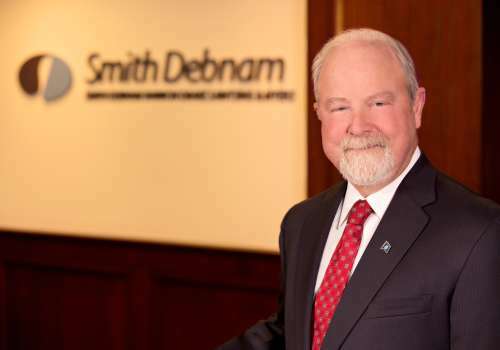 At Smith Debnam, we have three North Carolina State Bar Board Certified Specialists in Family Law who are available to consult with you on domestic issues. We have other lawyers and staff who are up to date on Family Law, and how it impacts your business and other assets. Hopefully, you will not need our services for this purpose. However, if you do, you can rest assured that we are understanding and knowledgeable regarding all of the issues that you will face.